When the Good Guy commercials promise you a friend to the end, they aren't lying. 2018 marks the 30th anniversary of serial killer Charles Lee Ray getting his soul trapped inside a disconcerting doll, and he shows no signs of slowing his spree. After seven movies and plenty of reinventions, there's a TV series in the works, and Chucky even pops up among the swarm of nostalgia favorites in Ready Player One. But thinking that Chucky's appeal is purely nostalgic does him a disservice. 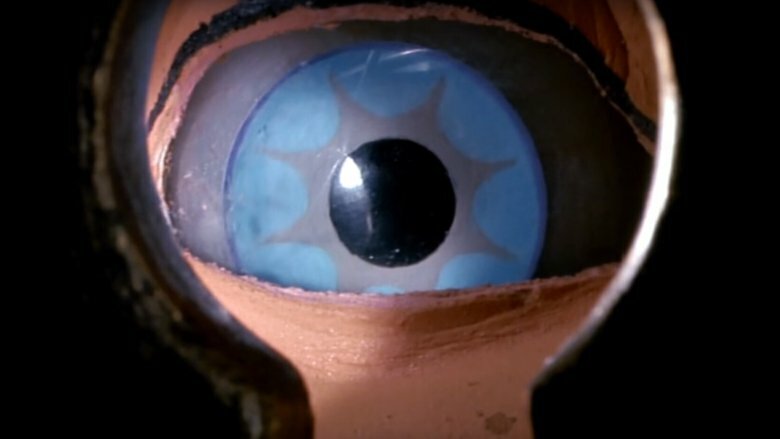 The Child's Play series is unique among horror franchises in its singular vision: while Freddy, Jason, and Michael get passed around by corporate rights holders cranking out sequels and chasing trends, Chucky's best friend has always been his creator, Don Mancini. Mancini has written every one of Chucky's outings, lending even the strangest detours a sense of narrative and creative continuity. He's also directed the last three features, keeping a tight-knit cast and crew onboard for a blood-stained labor of love. With the murderous plastic ragamuffin looming large as ever over the pop culture landscape, we're revisiting his three-decade journey, starting with the duller knives in the drawer, leading on up to the very sharpest. Sometimes, even killers fall victim to their own success. Child's Play 2 was a hit, and a third film was rushed into production so fast that it arrived in theaters a mere nine months later. The result feels as half-formed as burned plastic, an inoffensive but aggressively unmemorable outing that Mancini himself admits was a product of being "a little tired." In an effort to combat the "same old, same old" feeling, Child's Play 3 ages up Andy Barclay (Justin Whalin replacing Alex Vincent to compensate for the time jump) and sends him to a military academy. Chucky, reborn after the Play Pals company fires up its old factory, mails himself to the school to resume his quest for a human body. The package is intercepted by a younger boy, Ronald Tyler (Jeremy Sylvers), who Andy must protect with the help of spunky cadet Kristin (Perrey Reeves). There are certainly some fun high points, like a sadistic barber (Andrew Robinson), a colorful run through a carnival spook house, and a stylish main title sequence that features doll parts melting in reverse like an Aphex Twin video directed by Saul Bass. Mancini and director Jack Bender come very close to tapping into the horrors of macho conformity, but Chucky's methods and motivations have never been less inspired. The best idea for the movie, a swarm of possessed dolls descending on the conflict, was lost to budget constraints, though it would be revived 25 years later. It's rare that the first film in a series ranks this low, but when your sequels are as inventive and ambitious as Child's Play's are, that's hardly an insult. Despite deserving major credit for being the one that started it all, it relies on a sense of mystery that just doesn't hold up now that Chucky is a horror icon. Don Mancini (who shares writing credit for the only time in the series, with script revisions from John Lafia and director Tom Holland) drew inspiration from his father's career in advertising. 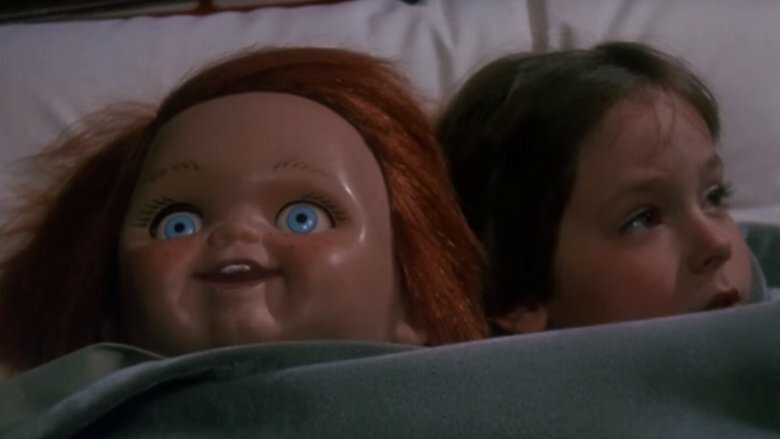 Combining the well-worn "Killer Doll" trope (see Trilogy of Terror or The Twilight Zone's Talky Tina) with a satire of 1980s Cabbage Patch consumerism, Child's Play opens with serial killer Charles Lee Ray (Brad Dourif) getting gunned down by police in a toy store. Fortunately for him, Charles just happens to dabble in voodoo, which he uses to hide his soul in the nearest object: a trendy Good Guy doll. When that doll ends up in the hands of young Andy Barclay (Alex Vincent), strange things begin happening that his mother (Catherine Hicks) can't explain and a homicide detective (Chris Sarandon) won't believe. What holds Child's Play back from ranking more highly is that it doesn't fully realize the potential of Chucky's personality. He doesn't start talking until the film is half over, and is generally muted by a grim tone that doesn't quite fit the absurd premise. Dourif, an Oscar-nominated character actor, only gets to really let loose in the sequels, and his foul-mouthed charm is sorely missed here upon revisit. 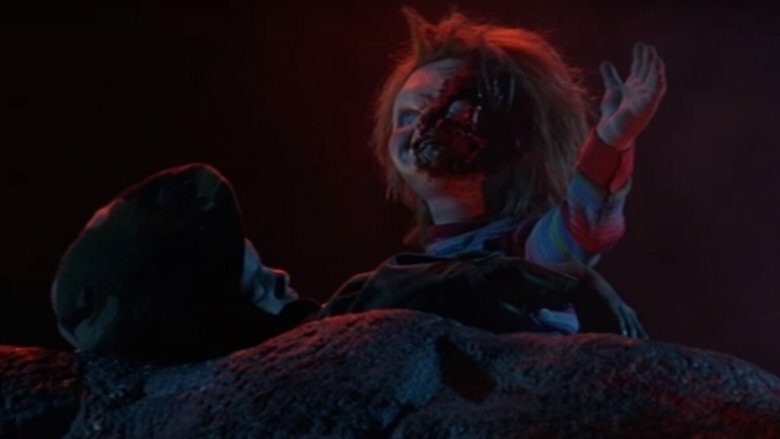 It's unlikely that anyone working on the Child's Play movies ever thought they were making the soberest of dramas, but it took death and rebirth for the series to truly confront its comedic potential. The disappointing performance of Child's Play 3 sent Chucky's cultural cachet into a seven-year coma. His salvation would come at the hands of an old flame, Tiffany (Jennifer Tilly, another Oscar nominee joining Dourif), one of the most refreshing breaths of fresh air ever injected into a franchise mid-stream. After reviving her darling dolly using Voodoo for Dummies, murder enthusiast Tiffany remembers just what a cad he always was. Their escalating war culminates in Chucky trapping Tiffany's soul in a doll of her own. From the moment Rob Zombie's "Living Dead Girl" blasts over Bride of Chucky's main titles, you know exactly what kind of ride you're in for. It's a delightfully trashy romp with slick style aplenty, courtesy of director Ronny Yu. The Bonnie and Clyde vibe introduced by the addition of a pitch-perfect Tilly makes for one of the finest brand reinventions in movie history. 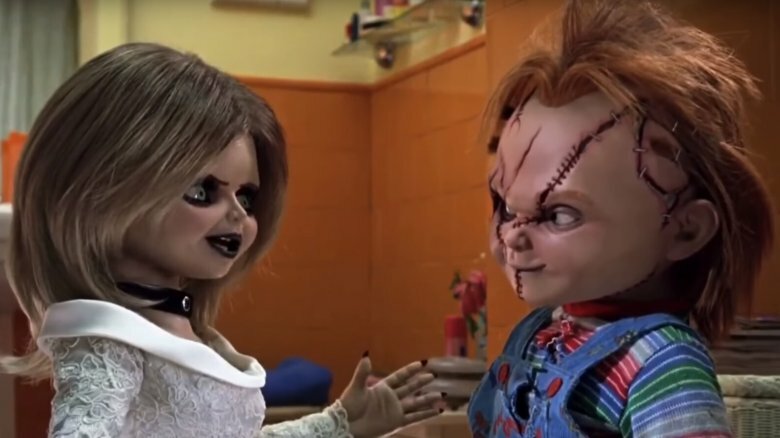 Most notably, Mancini cites Bride of Chucky as the beginning of "the queer identity of the franchise," a particular point of pride in his creation. If there's a weak point to the film, it's that the human characters are never as interesting as the dolls, leaving viewers wishing they could spend more time with Chucky and Tiffany. To fulfill that desire, look no further than the next sequel. Many long-running series have a sequel that polarizes fans, but not every franchise has a Seed of Chucky. Bolstered by the success of Bride's comedic bent, Mancini stepped behind the camera to make his directorial debut with the fifth film. The result is an absolutely bonkers melee of goofs that puts both the "out" and the "rage" in "outrageous." Jennifer Tilly had already stolen the show in Bride of Chucky, but in Seed, she flays the show's skin off and boldly struts around in it. She stars not only as the voice of Tiffany but also as a self-deprecating version of "Jennifer Tilly," who is desperate for a part in a biblical epic directed by Redman (yes, the rapper, who also plays himself). Chucky and Tiffany target Tilly as their new vessel after they are revived by their child (voiced by Billy Boyd), a gentle soul who is unsure whether to identify as "Glen" or "Glenda." Ed Wood films may not be the most progressive reference in creating a gender questioning character, but Glen/Glenda is the sympathetic heart of what is otherwise a pretty nasty splatterfest. Your affection for Seed of Chucky will depend largely on your tolerance for gross-out gags. John Waters, who appears in the movie as a vicious paparazzo, was clearly an influence on the heightened levels of bawdy irreverence. Though Seed was not well received, it has gained a cult appreciation for its undeniable boldness. In the years following Seed of Chucky, grim 'n' gritty reboots became the order of the day for horror series. One by one, Leatherface, Michael Myers, Jason Voorhees, and Freddy Krueger returned to screens in new continuities with angstier motivations, more muted color palettes, and generally less fun. 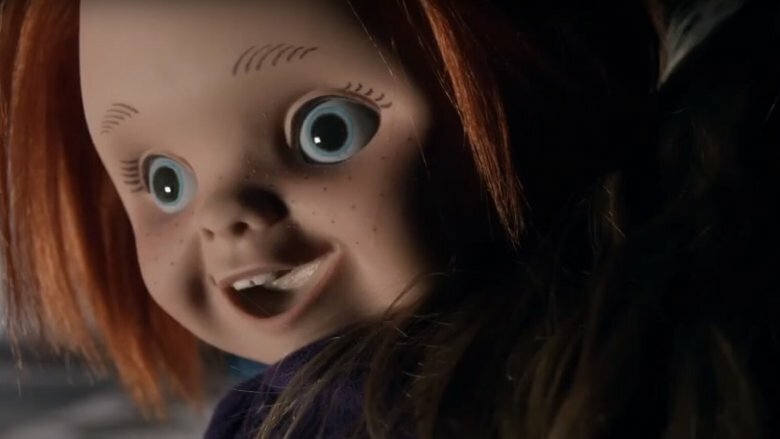 When Chucky finally returned, he seemed headed for the same fate, as advertising for the direct-to-video Curse of Chucky hinted at a sober tone, a cast of naïve new characters, and a pristine Good Guy doll. What fans actually found was another brilliant example of Don Mancini toying with their expectations. His directing chops improved immeasurably since Seed, he takes the series in a decidedly gothic new direction. Aside from a creepy mansion setting, Curse begins much like the original Child's Play, with a family mystified by the mishaps surrounding the seemingly silent Chucky doll. It even teases the question of whether or not any of the other movies happened in the same timeline, with characters struggling to remember why the Good Guy looks so familiar. When Chucky does start talking, though (with those familiar Brad Dourif tones), the twists start coming fast and furious as the movie reveals itself to be a direct sequel in some stunningly clever ways. Adding to the fun is the casting of Fiona Dourif, Brad's daughter and an excellent character actress in her own right, in the lead role of paraplegic Nica Pierce. Nica progresses from frustration with being underestimated by her family to rage at Chucky for what he's taken from her, and turns out to be an entirely new kind of "final girl." The best revelation? It turns out the "curse" of the title refers not to any voodoo, but to Chucky's f-bombs. There are few things more exciting for fans of a long-running franchise than a new installment that's as good as any of its predecessors while still introducing fresh ideas. It should thrill Chucky enthusiasts to discover that 2017's Cult of Chucky is far better than a direct-to-streaming seventh film has any right to be. Pulling together many of the series' best elements and taking them in new directions, it's one of the most surprising sequels in recent memory. After Curse, Don Mancini served as a writer and producer on Hannibal, and the influence of that show is on full display in Cult. In his third directorial effort, Mancini brings more tools to the table than ever, crafting truly striking visuals, psychological twists, and artful murders that could just as well be straight from Dr. Lecter's cookbook. Cult of Chucky follows Nica Pierce (Fiona Dourif returning) to a psychiatric hospital, where she's been fully convinced of her own responsibility for the previous film's murders by an abusive psychiatrist (Michael Therriault). Things get weird with the introduction of a therapeutic Good Guy doll, and even weirder when another shows up…and another. Finally, the titular cult concept comes to fruition, with delightfully chaotic results. 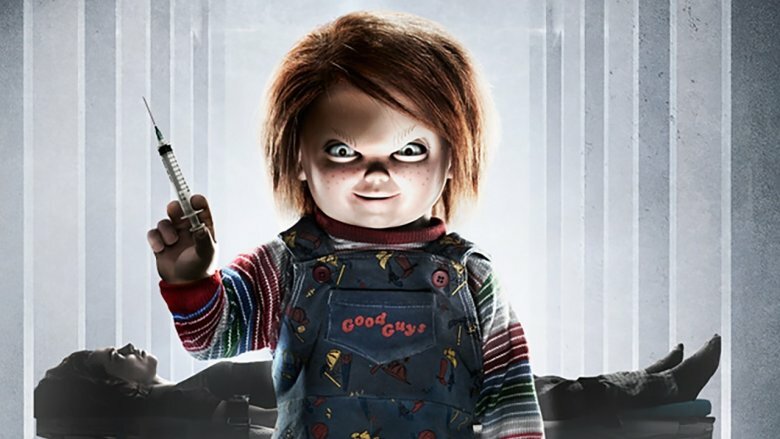 Taking Nica in intriguing new directions while Jennifer Tilly pulls the strings as herself/Tiffany and Alex Vincent returns at last as an all-grown-up Andy Barclay, Cult of Chucky is the ultimate payoff to this 30-year reign of terror. At the same time, it refills the tank and promises more fun to come. Make sure to catch the unrated version for the return of yet another old friend after the credits. Cult may in fact be Chucky's finest hour, but its delights are aimed squarely at long-time fans of the series. For the top spot in our ranking, let's take a look at a movie that can stand totally on its own as the platonic ideal of a killer doll adventure, perfecting the concepts of its predecessor with a balance of laughs and frights. For the Chucky-curious, there may be no better place to start than Child's Play 2. The first pleasant surprise the sequel has in store is its cast of cult favorite character actors. Connoisseurs of weird cinema will thrill as the main titles announce the presence of Jenny Agutter (Logan's Run), Gerrit Graham (Phantom of the Paradise), and Grace Zabriskie (Twin Peaks). Alex Vincent is back as young Andy, with his rebellious new foster sister, Kyle (Christine Elise) as his only ally. And, as always, Brad Dourif is back as Chucky, getting to really dig into his sadistic personality in a way the first film didn't allow. Child's Play 2's other secret weapon is just how good it looks. With Ivo Christante's production design looking like a Midwestern Suspiria and striking cinematography by Stefan Czapsky (best known for lighting Tim Burton's early work), it's much more a feast for the eyes than just about any other slasher sequel. Some of Chucky's most creative kills are here, as he utilizes a ruler, a copier, and a sewing machine to terrorize his unsuspecting victims. Top it all off with a climactic doll factory chase unmatched in its inventiveness, and you've got a horror-comedy classic that's just about as fun as they come.